Fall in College Station is a wonderful time of year to enjoy milder temperatures and get outside before the chillier days take hold. Whether you are headed downtown to enjoy some fantastic Texas barbecue or visiting the George Bush Presidential Library and Museum, there are few places to take in fall in our beautiful town. Aggieland Green, your local lawn service experts, know that you’ll want to enjoy as much time as you can outside this fall, so we’ve put together some tips to help keep your lawn green and healthy for all your outdoor events with friends and family. Aggieland Green specializes in lawn care services that can free up your precious time for football, time with the kids, or anything else that you like to try and do more of at this time of year. Give us a call and talk and let us know how we can help with your fall lawn care this year. Weeds thrive in the summer heat of Texas. If you’re not consistent about pulling weeds in your yard and treating for them effectively, you can find yourself overwhelmed by the amount of work you’ll have to do. Worse yet, weeds are excellent at stealing the moisture and nutrients that your lawn needs to stay healthy in the autumn. Don’t neglect this crucial part of fall lawn care at your home. Fertilizing your lawn in the fall is the best way to make sure that your grass has the nutrients it needs to re-establish itself successfully come spring. When shopping for fertilizer, make sure to talk to your local lawn and garden store about the kind of grass that you have growing in your yard. Some varieties are more particular than others, and we don’t want you wasting your time and money. 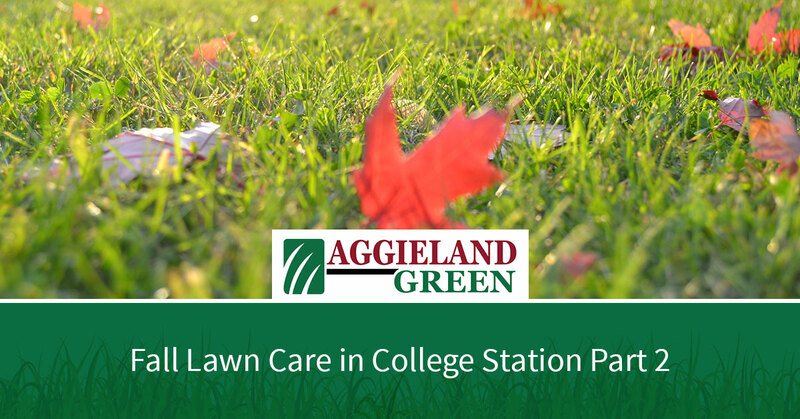 Aggieland Green is known locally for its affordable and effective lawn fertilizer services. If you’d like the pros to help you with handling this or any other lawn care service, then we are the right lawn fertilizer company for you. Top dressing your lawn with compost is an excellent way to give it a shot in the arm and see a fairly quick “green-up” on spots that have been struggling. Make sure to evenly distribute the compost across the areas that need it most, and don’t lay it on too thick. Since we rarely see many below freezing days in College Station, continuing to water your lawn can be an important part of keeping your grass green, healthy, and ready to shine come spring. Since it’s not as hot out, and the days are a little shorter, you’ll want to remember to adjust your watering schedule — especially if you use an automatic watering system — accordingly. We hope that you’ve found these fall lawn care tips helpful and are able to enjoy a lush healthy lawn throughout the rest of the year. If you would rather not worry about taking the time and energy to keep up on your lawn this fall, let Aggieland Green help. With the most experience and the best reputation in town, we are the premier lawn care service in College Station. Call us today to learn more about all of our services and to let us know how we can help give you the lawn you want this fall.